Errol Spence versus Kell Brook II: does this fight have any legs, at all? Has Brook still got his legs? Fans may have read by now how the one-time “Special One” from Sheffield (no, not Naseem Hamed, who was VERY special, for a time) will fight on the June 1 bill topped by his compatriot, WBA/IBF/WBO/IBO heavyweight champ Anthony Joshua, who defends against the vocally determined Jarrell Miller, and Brook aims to make his fight against TBA count. 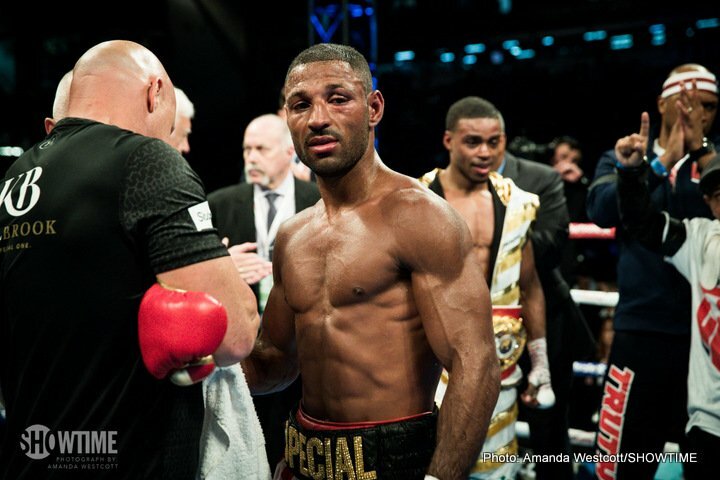 Brook was facially busted up in his misadventure of a fight with GGG, and Spence reopened those wounds; to the point that a tired and hurt Brook was forced to take a knee, unable to see. Now, having stated a few times how he had a less than 100 percent training camp going into the fight that is approaching its two-year anniversary, Brook, 38-2(26) and still just 32 years of age (33 in May), insists he can get one back on Spence should he be given the chance. It’s probably true that Spence, who has otherwise looked almost untouchable as a pro, had his toughest night against Brook. Certainly, “The Truth” has to admit how he lost a few rounds against the classy Brit. Who knows, maybe the fact that he had to dog and dig quite deep in order to secure the 11th round stoppage win bugs consummate pro Spence; perhaps to the extent that his, shall we say, healthy ego, urges him to fight Brook again with the intention of crushing him and leaving absolutely no doubt who is the far superior fighter. Maybe you have no question in your mind who the far superior fighter is out of these two, but perhaps Brook and, crucially, Spence do. It’s not at all a rematch that is in demand, but at the same time, we’ve seen lesser returns go down. Who knows, maybe, if Spence still has an itch that needs scratching when he thinks of Brook, we will see this particular sequel get made. First, though, Brook needs to look good against whoever it is he fights in New York in June.